License: Shareware, 2-minute recording trial, the registration fee is $24.95. Product Update (Registered users only): Free!
. Add high DPI support.
. Correct an error for recording from capture device under Windows 10.
. Correct some mini errors. Record audio from sound card directly to WMA, MP3, OGG, APE, FLAC or WAV format with high quality. Record sound directly from plackback device(only for Vista/2008/Widnows 7). Real-time sound monitor before recording, easy to select record device and adjust the volume(you may enable it on the Advance page of Record Option panel). Add files to File List automatially (File Append). 88KHz / 96KHz and 24Bit support only for WAV and FLAC formats now. Also, Not all audio device could be albe to support 24bit recording. What is the difference between FairStars Recorder and FairStars MP3 Recorder? 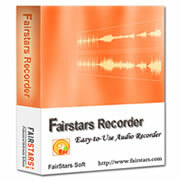 FairStars MP3 Recorder is the lite version of FairStars Recorder. FairStars MP3 Recorder cannot support WMA and FLAC format output, no audio cutter tool, also not support Recording Recording Schedule, etc.